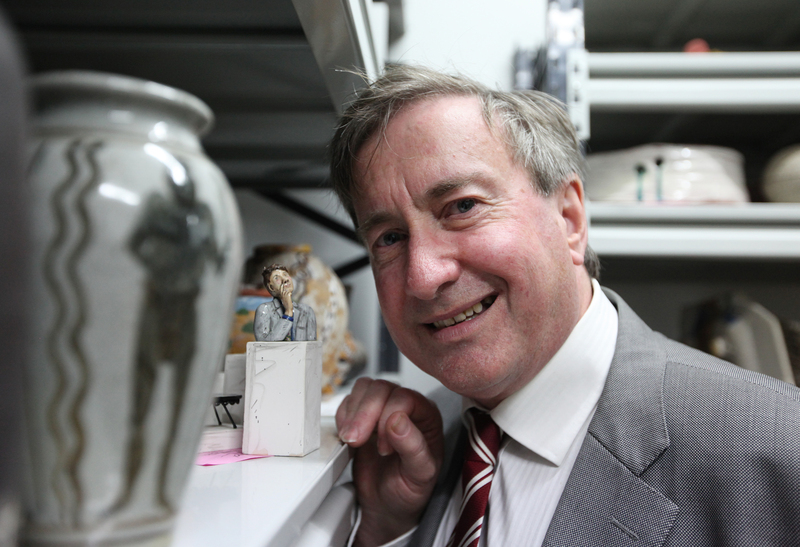 Former Shepparton Art Gallery director Joe Pascoe has returned to SAM this month to work in an acting capacity until October and see through one of the most important historical exhibitions SAM has presented, Delinquent Angel: John Perceval’s Ceramic Angels. Almost 25 years to this day, it’s great to be back. It’s fascinating on both a work and a life-cycle level to have the chance to come back and see how things have changed and improved – the gallery is now called a museum, and the city itself has grown, but has definitely remained as friendly as it was in the 1980s when I was here. I actually met my wife in the gallery basement when she was working here as a curator, and now we have Eve and John, our two little teapots! In 1961, John Perceval made one of his most beguiling and beautiful ceramic angels. Called Delinquent Angel, it shows a child-like angel with head lifted in mild disobedience. Its blazing red colour and wide staring eyes demand attention. Since being acquired by the Shepparton Art Museum (then Art Gallery) in the early 1970s, Delinquent Angel has travelled to Italy, Japan and Singapore and around Australia, notching up more frequent flyer points than any other of John Perceval’s 70 + ceramic angels. It is fitting then that our very own, most favourite little character lends his name to the title of SAM’s fabulous upcoming exhibition Delinquent Angel: John Perceval Ceramic Angels. Until the exhibition opening on 29 August 2014 we look forward to sharing more about Perceval and his wonderful Angels.